Working with the CE Academy across entire academic years means that our workshops take place in all weathers. In 2014 Clare Abbatt‘s “Sculpture and Survival” workshops, which drew inspiration from her own exhibition examining Captain Scott’s Terra Nova expedition to Antarctica, turned the frozen temperatures to our advantage. Educationalist and Fermynwoods collaborator Michael Supple has written about the importance of engaging students at the start of lessons. Often Clare’s workshops begin with something almost approaching a lecture. Delivered the wrong way, particularly with students that may have difficulties maintaining concentration, this would be setting yourself up to fail and too much “like school” – the version of a system that has already failed these students. Instead, Clare demonstrated many of Michael’s Principles of Practice, ensuring complete engagement throughout the workshop. One Principle of Practice is Curiosity. Another is Storytelling. Clare piqued the students curiosity from the outset, projecting photographs of huge glaciers onto the walls at Sudborough Green Lodge. Clare then regaled the group with the story of Scott’s expedition aiming to be the first to reach the geographic South Pole but up against the Norwegian team led by Roald Amundsen. Another principle is Relationship, a bridge to take students from where they are familiar to somewhere unknown by looking at a subject through their eyes. Clare did this by inviting students to draw items they would take on their own imaginary expeditions. Students collectively coming to the realisation that it would be more prudent to take warm clothes, a map and a compass than it would taking 400 boxes of cigarettes. Other items were added and removed by consensus, all agreeing that pictures of their families would be sensible to pack. One of my favourite principles is Competition. After trying to squeeze their hands into frozen gloves that Clare had been storing in the freezer, their resistance to the cold temperatures was tested by a competition to see how long they could each submerge their hands in buckets of ice. Clare providing further motivation by continuing to tell the story of Scott’s expedition. After discovering that Scott’s party had endured through all manner of hardship to make it to the South Pole, students were about to remove their hands from the ice triumphantly. Clare broke the news that Amundsen had beaten Scott’s expedition by 34 days. Undeterred, one student kept his hands in the ice. He wasn’t just going to win this challenge, he was going to beat all other challengers in workshops to come. At this point Clare dryly produced a series of photographs of blackened frostbitten hands with missing digits to encourage the challenge to an end. 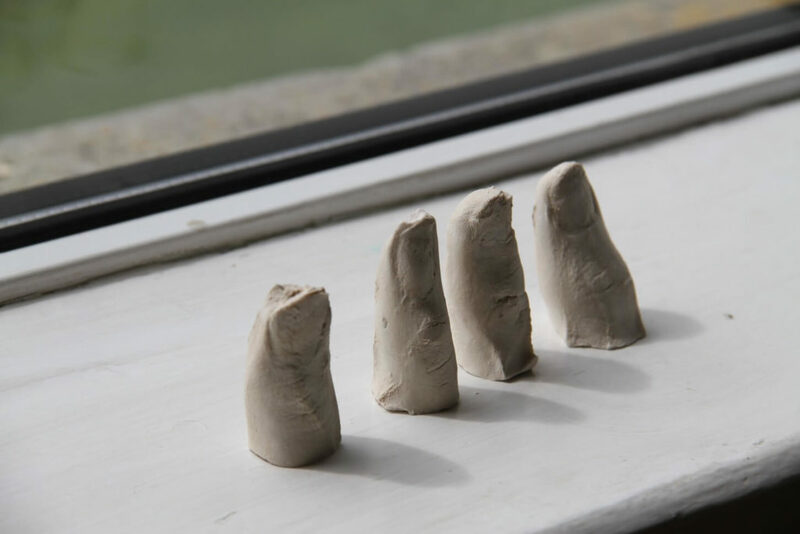 Students would later cast and sculpt hands and dismembered fingers, which I am still finding in cupboards at Sudborough Green Lodge to this day, as if they had dropped off in the cold and lay dormant in the snow. They also made large scale portrait drawings using the techniques that Clare had used in her exhibition. Had the workshop begun as simply a sculpting and drawing class the results would have not been half as impressive or meaningful – demonstrating that like Scott’s expedition the journey was more important than the destination. This entry was posted in Education, News and tagged Alternative Mondays, Alternative Provision, Clare Abbatt, The CE Academy. Bookmark the permalink.